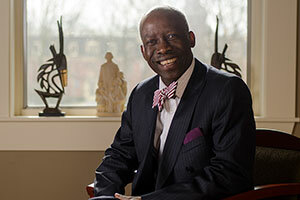 January 7, 2019 Kazi Joshua has been named Whitman College's vice president for student affairs and dean of students. Joshua has been serving as the interim dean since June 2018 and will assume the role in a permanent capacity effective immediately. He has led the college's diversity, equity and inclusion efforts since 2015. December 17, 2018 In 2017, Whitman College staff, faculty and friends came together to share their favorite holiday recipes for a special cookbook. The cookbook was released in December 2017 as part of the college's annual holiday card for alumni and friends. December 17, 2018 Tim Howell '18 is pursuing his basketball career as a player for Team Trouble in the ABA league near San Francisco, California. December 14, 2018 The students of Stanton Hall, Whitman's new residence hall for sophomores, bring a special holiday greeting. December 14, 2018 The first product patent issued to Whitman College is based on an invention by Carl E. Peterson Endowed Chair of Science and Professor of Physics Douglas Juers. December 14, 2018 Whitman alumnus creates foundation to help raise the profile of snakebite victims and improve treatments. December 10, 2018 Each December President Kathy Murray and her partner, Bridget Reischl, open their home to students for a pre-finals study break. This year's event, held Sunday, Dec. 9, featured a chili bar, decorate-your-own sugar cookies and festive movies. The sugar cookies are made with an old family recipe created by Reischl's mother. December 6, 2018 "December is always a great time in Walla Walla," said Neal Christopherson, director of institutional research at Whitman College. "Even if the weather is gloomy and the days are short, there are so many community events, both at Whitman and in Walla Walla, and that helps make the mood around town feel more festive and celebratory." December 6, 2018 Considered China's equivalent of the Rhodes Scholarship, the Schwarzman Scholarship was awarded to just 147 students this year out of an applicant pool of more than 2,800. Those selected represent 119 universities and 38 countries, with only 40 percent of recipients originating from the United States. December 5, 2018 Race and ethnic studies major Erina Horikawa '19 is helping to enrich bodies and minds through her one-year fellowship with Walla Walla Valley Farm to School, a local nonprofit organization. December 3, 2018 Whitman College is offering deadline extensions and fee waivers to all high school seniors who have been impacted by the recent wildfires in California and the earthquake in Alaska. December 3, 2018 Nina Finley '17 made school history this week by becoming the first Whitman College graduate to claim a highly competitive Marshall Scholarship. Only 48 candidates were selected as 2019 Marshall Scholars from a field of more than 1,000 applicants. November 29, 2018 Assistant Professor Brit Moss incorporates elements of a NSF-funded collaborative maize project into her synthetic cell biology class. Whitman students taking the class get the opportunity to contribute to scientific research while gaining first-hand experience into the type of research life scientists do in the field. November 29, 2018 Rachael Alexander ’13 knows a thing or two about government archives and public records. Alexander will discuss “How to Discover Government Secrets and Impress Your Date with the Public Records Act” at 7 p.m. Thursday, Nov. 29 in Olin Auditorium. November 27, 2018 Whitman Teaches the Movement (WTTM) is the pioneering program that leads conversations about civil rights on campus all year long and in participating Walla Walla public schools. November 19, 2018 On a recent Friday at Whitman College, students and staff gather in the living room of the Glover Alston Center. As they munch on pizza from Sweet Basil Pizzeria, Daphne Gallegos '19 leads the group in a discussion about hostile attitudes and behaviors that can occur during campus interactions.